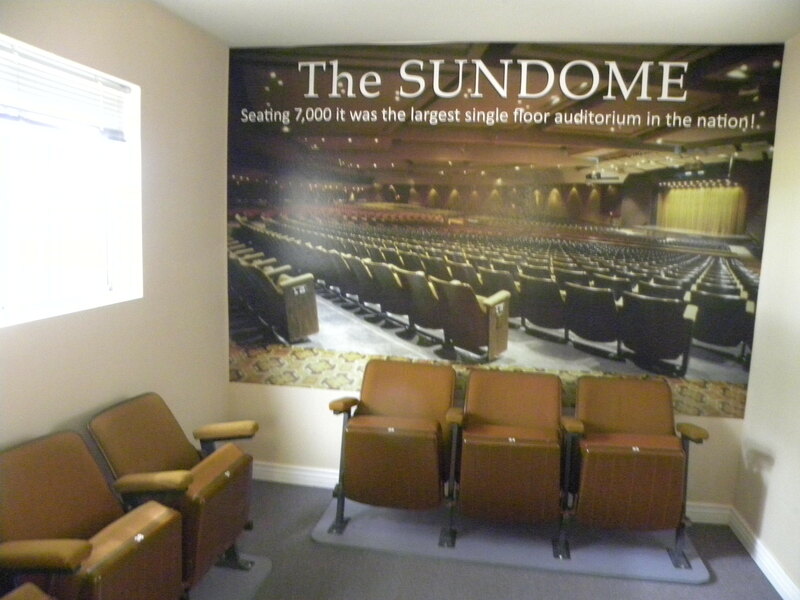 Sundome Jr. – Arizona’s smallest theater! Thanks to a number of museum volunteers, six seats were rescued from the Sundome in Sun City West before the building was demolished. They formed the nucleus for an exhibit on the Sundome, complete with a wall-size mural showing the immensity of that enormous structure. After viewing the exhibit, museum visitors can relax in one of the Sundome seats and watch the film, “The Beginning.” This was originally shown to prospective residents in the 1960s to give them an idea of what life was like in an active adult community. The Sundome exhibit was sponsored by Don Tuffs who managed the facility from 1980 to 1984. The theater is housed in a 10’x10’ room that was added to the museum in the 1990s. It is the oldest structure in Sun City, having originally served as an information & sales office along Grand Ave. when construction of Sun City began in 1959.